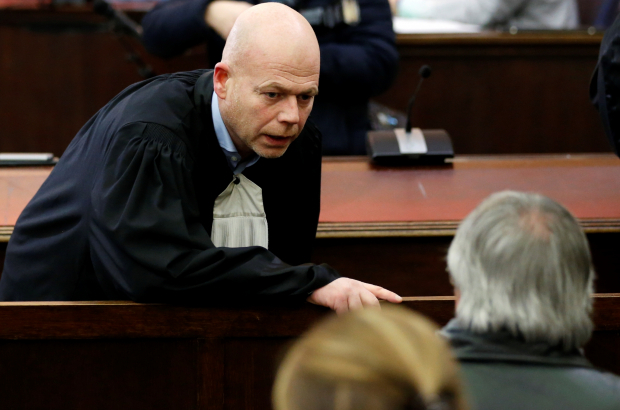 Sven Mary, the lawyer representing terrorist suspect Salah Abdeslam, has asked for his client to be acquitted on a technicality. Abdeslam, the only survivor of the November 2015 terrorist attacks on Paris, went on trial in Brussels last Monday. The trial is not related to the Paris attacks but to a shoot-out between Abdeslam and Brussels police in March of 2016. Abdeslam, a French national, was born and lived in Brussels, to where he returned following the Paris attacks. The charges are attempted murder of police officers in a terrorist context and possession of illegal weapons. Mary (pictured) pointed to a procedural mistake in the investigation into the shooting, in which a second suspect was shot and killed by police and a third, Sofien Ayari, was arrested with Abdeslam and is also on trial. In true Belgian fashion, the technicality has to do with language. The lawyer is arguing that because the Dutch-language dean of the investigating judges was ordering an investigation by a French-language judge using French-language documents, all investigations based on those documents are invalid. He therefore wants the case thrown out and Abdeslam set free. According to the prosecution, the designation of an investigator by the judge is an internal affair and not an investigative act in and of itself. Therefore, the language legislation does not apply. If the court agrees with Mary, there would be no choice but to dismiss the charges. This would not see Abdeslam walking the streets, as he is still to stand trial for his part in the Paris attacks. Abdeslam was in Paris on the night of the attacks, but abandoned his suicide bomb vest, which, it was recently revealed, malfunctioned on the night.